Commercial preparations containing synthetic cannabinoids (SCBs) are rapidly emerging as drugs of abuse. 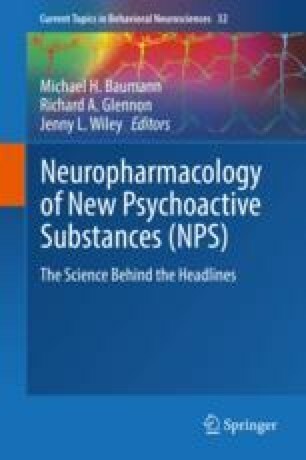 Although often assumed to be “safe” and “legal” alternatives to cannabis, reports indicate that SCBs induce toxicity not often associated with the primary psychoactive component of marijuana, Δ9-tetrahydrocannabinol (Δ9-THC). This chapter will summarize the evidence that use of SCBs poses greater health risks relative to marijuana and suggest that distinct pharmacological properties and metabolism of SCBs relative to Δ9-THC may contribute to this increased toxicity. Studies reviewed will indicate that in contrast to partial agonist properties of Δ9-THC typically observed in vitro, SCBs act as full CB1 and CB2 receptor agonists both in cellular assays and animal studies. Furthermore, unlike Δ9-THC metabolism, several SCB metabolites retain high affinity for and exhibit a range of intrinsic activities at CB1 and CB2 receptors. Finally, the potential for SCBs to cause adverse drug–drug interactions with other drugs of abuse, as well as with common therapeutic agents, will be discussed. Collectively, the evidence provided in this chapter indicates that SCBs should not be considered safe and legal alternatives to marijuana. Instead, the enhanced toxicity of SCBs relative to marijuana, perhaps resulting from the combined actions of a complex mixture of different SCBs present and their active metabolites that retain high affinity for CB1 and CB2 receptors, highlights the inherent danger that may accompany use of these substances.